A crowd of 37,774 turned out for the Fourth Division clash between Crystal Palace and Millwall at Selhurst Park on 31st March 1961 – a figure that remains the record attendance for the fourth tier of English football. Attendance was helped by the fact the game was a Good Friday bank holiday fixture, and by the fact that Palace versus Millwall is the game that probably has the strongest claim to be the one true South London derby. Millwall won 2-0, but Palace went on to clinch promotion. In fact, no less than four teams can lay decent claim to participating in the South London derby: Palace, Millwall, Charlton Athletic and Wimbledon. However, Palace-Millwall is the oldest rivalry, dating back to 1906, and has been played the most often – a total of 132 times. Millwall Athletic, as they were way back then, are the oldest team of the four, having been formed in 1885, 20 years before Palace and the Addicks. The first competitive game between Millwall and Palace came on 17th November 1906 in the Southern League. Palace won 3-0 in a game played at the Crystal Palace National Sports Centre, but with Millwall still based in East London, the game was not yet the South London Derby. The Lions then relocated to New Cross in South London in 1910. The first South London Derby actually staged in South London was played on 31st October 1910. A crowd of 3,000 saw Millwall lose 3-0 to Palace at The Den in a game played for the London PFA Charity Fund. The first derby in the Football League came on 15th January 1921 in the Third Division South. Again played at The Den, this time before a crowd of 20,000, Palace won 1-0. The Eagles also won the return fixture a week later, by three goals to two. Despite the early dominance of Palace, it’s Millwall who have the most success in games between the sides. The Lions have won 50 derbies to the Eagles’ 45. 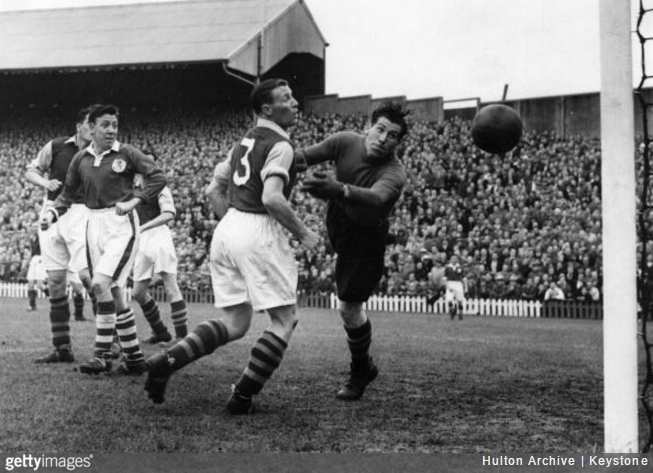 Games, such as the match pictured above at The Den in 1951, regularly attracted big crowds. But in the complex and tight knit geography of South London, seeking to class Palace and Millwall as the definite biggest rivalry risks courting controversy. Charlton and Millwall are separated by just four miles in South East London and contest a fierce derby of their own. Fans of both teams are fond of trotting out the line that Palace in fact hail from Kent due to the county’s ancient boundary running through the area. Charlton see Palace as their main rival, ahead of Millwall, while Palace hate Brighton the most, ahead of Millwall. Millwall fans really don’t like West Ham either, placing that rivalry above the one with Palace. AFC Wimbledon fans reserve their main ire for MK Dons, for reasons well-documented elsewhere, but have little time for Palace either. Got that? We’re glad somebody does. A good read. Palace and Millwall will always be the South London derby in my eyes. I look for this fixture first when we were in the championship over brighton. Be good to get them again in the cup in the coming season. Never really had any hate for charlton. Do have a soft spot for afc wimbledon especially how they bounced up the league’s.